Ducks and Beavers are below Utah in the Pac-12 standings, but that could change this week. 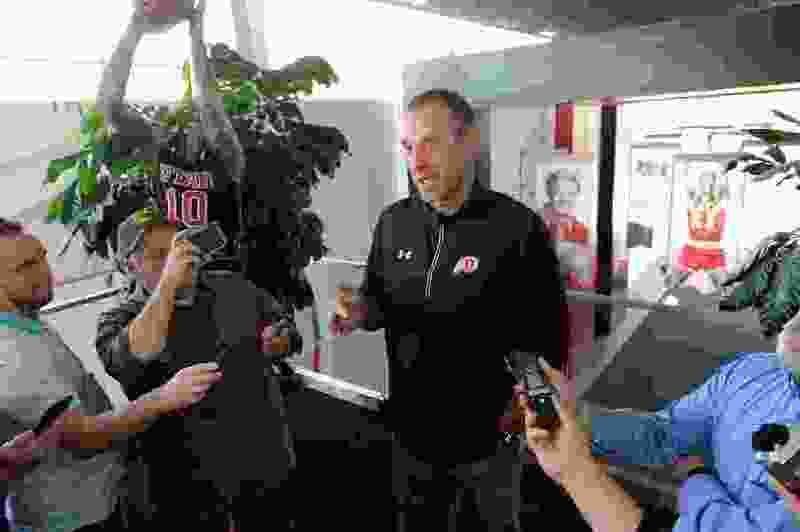 (Francisco Kjolseth | The Salt Lake Tribune) Utah basketball coach Larry Krystkowiak speaks with the press during media day at the Ute basketball practice facility on Wed. Sept. 26, 2018. Utah coach Larry Krystkowiak recognizes where the Pac-12 fits into the college basketball landscape these days. Yet when he studies the teams coming into the Huntsman Center this week, he's not seeing much evidence of a downtrodden conference. The outside world agrees with the last part of that statement. ESPN’s Bracketology gives the Pac-12 only two bids, with first-place Washington as a No. 8 seed and Arizona State (tied for fourth) as a No. 11 seed, playing a First Four game. That’s a major drop-off from three years ago, when seven schools made the field. Once a national narrative gets going, there’s no stopping it. Arizona’s consecutive losses by 20-plus points at USC and UCLA last weekend damaged the conference, as opposed to the winning teams being boosted by routs of the Pac-12′s flagship basketball program. The perception of the Pac-12 probably is not helped by the fact Utah (11-8, 5-2) is tied with USC for second place, after losing to the likes of Minnesota, Northwestern and Hawaii in November. The Utes have improved offensively and defensively; they also have thrived against the bottom tier of the conference and have a lot to prove against tougher competition to come. Disregarding the standings, Utah likely will be an underdog in its next seven games, according to the kenpom.com analytics. The scheduling upgrade begins Thursday night with Oregon (12-8, 3-4), the conference’s preseason favorite. The Ducks lost freshman center Bol Bol to a season-ending injury and forward Kenny Wooten missed four games, including the start of Pac-12 play. Louis King, another freshman, has emerged lately and Oregon would have the same conference record as Utah if not for two missed opportunities — blowing a nine-point lead in the last minute of regulation against UCLA and then failing to finish a rally vs. Washington, partly due to a controversial foul call. Krystkowiak labels Oregon “an extremely athletic group.” The Utes prepared for Oregon's pressing defense by playing four offensive players against five defenders in Monday's practice. Oregon State (12-7, 4-3) will follow the Ducks into the Huntsman Center on Saturday. The Beavers play Thursday at Colorado.